Hardware specifically designed for LTC applications, including infection control keyboards, high performance processing, fingerprint login technology, and long-lasting batteries. Safeguards in place to prevent missed medications or the administration of medication to the wrong resident. Access to digital photos of all Residents and their medications, reducing medication incidents. Bar code scanning ensures all "7 rights" are adhered to: resident/drug/dose/time/route/reason/documentation. Easy eMAR includes a Computerized Physician Order Entry feature, further improving accuracy and efficiency. 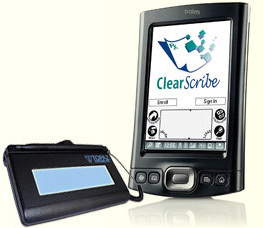 Medication errors associated with illegible physician handwriting are virtually eliminated! Eliminate faxing and digital pen orders!